Shahid Buttar is running for Congress! Shahid’s been on the front lines of the fight against warrantless surveillance since even before Get FISA Right started in 2008. He worked very closely with us during his years at Bill of Rights Defense Committee – and with other grassroots civil liberties organizations like Restore the Fourth. More recently, he’s been at EFF and on the board of Center for Media Justice. Now, he’s taking things to the next level and running for Congress in San Francisco … for the seat currently held by Nancy Pelosi. Every Member of Congress had the opportunity to decide whether to protect Americans’ privacy, and shield vulnerable communities from unconstitutional targeting, or to leave broad spying authority in Trump’s—and Jeff Sessions’—hands. Of course, Shahid’s strong position on surveillance is only part of his platform; ShahidForChange.us also highlights issues like reducing government and corporate corruption, reducing military spending to save social services, and ending federal prohibition of cannabis. Still, all the polls show that the majority of Americans oppose warrantless wiretapping — and my guess is that the percentage is even higher in San Francisco. So it’s great to see a pro-civil liberties candidate making it a big part of their platform. A few years ago on one of the Get FISA Right phone calls we were lamenting how politicians continue to shrug their shoulders at the NSA’s ongoing pattern of misleading Congress and avoiding any kind of oversight, and I remember saying “things won’t change until the civil liberties vote makes the difference in elections.” Now’s as good a time as any to start! Call the Rules Committee Tonight! 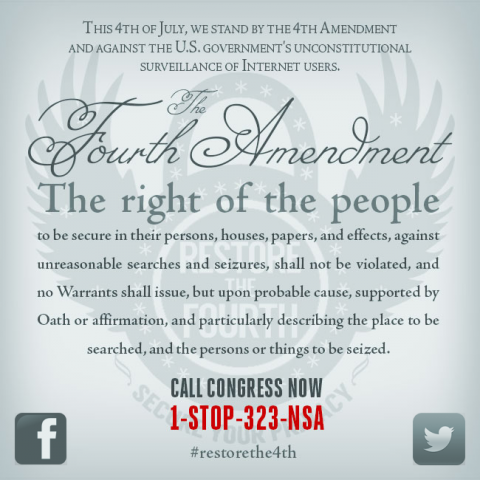 I got an e-mail from Fight for the Future an hour or two ago (they were still answering the phone when I called), asking for a quick phone call to tell the Congressional Rules Committee, which will be voting on FISA amendments, to take another step toward restoring the privacy that we once had. Here is the link: http://tinyurl.com/2ffltx; Decide the Future gives the phone number to call, asking that we let the committee know that we support the Massie-Lofgren Amendment to defund mass surveillance under Section 702 of FISA. The group that created this blog have been asking the president, Congress, anyone who will listen to “GetFISARight” for almost a decade now—through President Obama’s full 8-year administration (we grew out of a My Barack Obama group opposed to the then-senator’s support for warrantless wiretapping in July 2008), so don’t stop now! Pick up the phone, make the call, and Tweet the link! If you are a long-time reader here, you know why this matters—otherwise, scroll down. So we have been silent. . .
. . . but that does not mean that we are not aware of what is happening, fighting on our own. Speaking for myself, I came here a couple of days ago to figure out how to put up the banner for “The Day We Fight Back”, yesterday (ugh!) and failed miserably—tech challenged. My time would have been better spent writing a post, as I am doing now. The letter that was sent by those who clicked on the links presented in that banner hit on various Internet issues, including our own FISA, but also SOPA, the TPP, etc. I hope everyone has been following the TPP information—TransPacific Partnership. It seems that, from what has been leaked/reported about these secret negotiations, the main elements of SOPA—the Stop Online Piracy Act that was defeated by public outcry last year—are included in the TPP. This takes it out of U.S.A. jurisdiction, makes it global and gives our government a pass—they can say that their hands are tied, they are just following the international agreement. Please, get involved—there are weekly conference calls on Sundays, “TPP Tuesday” Twitter storms weekly, and probably more where you live. Yes, we still care—we are also very busy, but let’s all find a bit of time to keep abreast of these issues, and communicate wherever we are. What’s up with that, anyway? This month has been a busy one from a government-surveillance perspective. We are finding that our country is no longer what those of us of a certain age remember. Some of us are wondering how long we have been sold a bill of goods, even rethinking Watergate—yes, that president resigned in disgrace, despite his allegation that “if the president does it, it’s legal” (which a generation rose up to decry). Yes, we put in an entire system of laws, including the FISA court, to prevent such actions from recurring. But no, it seems that, rather than being an isolated incident by a rogue president, it was instead—as we might have learned from the Pentagon Papers, which Daniel Ellsberg courageously released to the public through The Washington Post and The New York Times (the Internet not yet being even a glimmer in some DARPA scientist’s eye), as Bradley Manning released information via WikiLeaks on the ’Net. And yesterday, the announcement of closing embassies on Sunday (not sure what to think of that) and a global travel alert asking U. S. citizens to register with our consulates overseas. Would that make you feel safer? Actually, we did know—this group formed in July 2008, in reaction to then-Senator Obama’s vote on the FISA Amendments Act—a vote to, among other things, give retroactive immunity to telecommunications companies for warrantless wiretaps. Little did we know about PRISM, or Bountiful Informant—which were probably not in full flower then, maybe did not exist—but the seeds were there. Very few of us would change the results of the 2008 presidential election—even those of the 2012 election, as a third-party presidential candidate is virtually unelectable in this country. However, by November 2011 tour mission statement proclaimed us no longer “proud Obama supporters”, but “informally affiliated individuals who supported President Obama during his candidacy in large part because of his call for hope and a new kind of politics.”. At least some of us voted third parties in 2012, or sat out the presidential vote. Here, we have continued to rail against the policies that have been created or followed since 2008 (as have others, elsewhere, of course). In the first Obama election, we were among the majority who elected a candidate whom we believed would diminish the power of the imperial executive branch, not to expand those powers (a candidate, I remind you, who ran on a platform of transparency). Not completely naïve, we did note in 2009 how difficult that would be for even the best candidate, once in office (read back through our posts from that time), but we certainly did not expect expansion of powers, nor the secretive surveillance state that seems to be in place today. Consent of the governed is meaningful only to the extent that it is informed consent. Bradley Manning let Americans, and many others around the world, know what their governments were really doing. The disclosures caused problems for leaders in many nations who much preferred to operate behind an opaque curtain. . . .
It’s easy to insist that Bradley Manning must face the consequences of his actions. But we badly need whistle-blowers like Manning because U.S. government leaders do not face the consequences of their actions, including perpetual warfare abroad and assaults on civil liberties at home. No government should have the power to keep waging war while using secrecy to cloak policies that cannot stand the light of day. Thank goodness for the courage of Bradley Manning. It seems as though our government wants everyone’s information—unreasonable search and seizure be damned—but wants to share none. Unacceptable, I say—and encourage everyone to find a local Restore the Fourth event tomorrow and join the patriotic resistance. Here we are, about midway between our 5th birthday, June 26, and Independence Day, July 4. This post is overdue, as I have been reflecting on the anniversary just passed despite not getting over here to comment. But what to say? I’m not feeling very optimistic. There is not much to applaud in the fact that the president (once the candidate for whom we who cofounded this blog had so much hope) is “not going to scramble jets” to capture a patriot who released data to the United States public, not to an enemy; to know that Bradley Manning’s trial is going on right now, but that details are available only through a very few online sources* (Reader Supported News, FireDogLake, etc. ), to see The New York Times call the woman whose coverage they are quoting not a journalist, but an activist, is distressing—no cause for celebration. Then one hears an interview with the husband of Lynne Stewart, the New York lawyer and activist now in a Texas prison, approved by the Texas warden for compassionate release. One learns that the paperwork for her release is now held up in Washington, and when her team asks for a more-legible copy on which to make their case, they are brushed off with “go through FoIA [Freedom of Information Act]”. And one—if lucky—finds in the press (or in a blog’s responsive comment) a mention of James Clapper, who admittedly lied to Congress, on the record—where is Attorney General Eric Holder’s commitment to prosecution? So am I hopeful this year? No, not very. However, there are 2 recent posts here that are encouraging—a new group called Restore the 4th has taken up the mantle, with a couple of our own involved. Let’s make a noise this 4th of July! Let’s start some meaningful conversations—at the parades, at the picnics, before the fireworks go off, let’s talk about what the holiday really means, beyond a day off from work midweek and sales at the malls. Despite understandable criticisms of slavery and limited voter enfranchisement in the 1700s, I prefer to focus on the radical aspects of the events surrounding 4 July 1776, when this country began in revolution against the tyranny of taxation without representation, the “divine right” of kings, and for the “unalienable rights [of] life, liberty, and the pursuit of happiness”. It is time—well past time!—for our nation to remember and demand that our current government honor its founding principles. As we regroup after 5 years, we think of our original description—a proud group of Obama supporters. Yes, we were! We were because, at the end of President G. W. Bush‘s 2 terms, we had Hope; we wanted Change. The candidate expressed concern with, and a goal of ending, the ever-more-imperial presidency. We congratulated the president on his election—with a television ad that we ran in the Washington, D.C. area, saying in effect, “We continued to support you; please make good on your promises and fix the FISA Act.” Five years later,we mostly feel that the current administration has proved unworthy of our early support; we were too optimistic and trusting. I wonder how many of us were comfortable enough with his record to support Mr. Obama in 2012? By March 2010, the group had changed enough to rewrite our mission statement; the new version described us as a proud group of informally affiliated individuals who supported President Obama during his candidacy in large part because of his call for hope and a new kind of politics. I suspect that in the last presidential election, many of us were looking to Jill Stein, Rocky Anderson, or another third-party candidate for real change. However, there was still some work being done to bring the Democrats back on board; in December 2011, some of us took to the Organizing for America offices to discuss the NDAA renewal with campaign volunteers (for instance, see https://getfisaright.wordpress.com/2011/12/). Now, just 10 months later, the graphic image atop this blog is a disturbing map of metadata collection for analysis, by country, leaked to the world from the NSA’s Bountiful Informant program by whistleblower Edward Snowden. So we ask, Who are we today? We had a poll here (for the record, 2 unafilliated, 1 each Libertarian, Occupier, and Other—who says we are not diverse? or unconventional? ), but the poll’s wording really made it appear as though we were suggesting that we are our political-party identity. Not true, not even close to true—for all the polarization of late, for all the “Red Team/Blue Team” name-calling that goes on, we hearken back to the days when alliances were formed along lines of position on issues, not necessarily nor automatically in alignment with an individual’s party. We feel that that was a better way—and we call on our fellow citizens to demand it of those in and running for office. You are currently browsing the archives for the NSA category.